3D Gel show plates designed and built by you. Order your car show plates online NOW! High Quality Custom number plates, showplates for cars, motorcycles and 3D Gel show plates. Our custom and unique 3D Gel Show Plates are enhanced with the addition of our POWER-EDGE© , STEEL-EDGE©, GRAPHITE-EDGE© POWER-BLADE© and now the all NEW JET BLACK-EDGE© Use Our Custom Show Plate Maker for all your show plates needs. We are available from Mon - Fri 9.30am - 5.30pm GMT Sat 10.00am - 1.30pm GMT. View our stunning range of examples. View our stunning range of Car Club examples. We manufacturer and supply reflective acrylic vehicle registration show number plates for cars, car show, show meets, trailers, caravans, motorcycles and bikes. If you're a member of a Car Club, Owners Club or Cruise Club check out our show plates examples and need a unique tailor made set of plates for that special meet. E-Mail us with your requirements and we will discuss quantity discounts for that special one-off or bulk orders and give you a unique discount code for each club, you could even earn money for your club by joining our affiliate scheme and receive as much as 20% commission for each sale. If you have a design that you would like on your plates, we can do this without delay. Just supply a description or image, we'll take it from there. 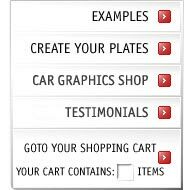 You must ask your self before you buy any plates from any other site... what print quality can i expect, click so we can help you with show plates quality, honest and truthful answer. We are the leading showplate site where you can order plates through our secure server and receive them on your door step within *48hrs throughout the UK. We are available from Mon - Fri 9.30am - 4.30pm GMT Sat 10.00am - 1.30pm GMT. Please note: We do not sell registration numbers (marks) we only manufacture the plates. step1: Enter your registration, choose your design, create your plates. step3: Enter your delivery details, payment details and checkout. Then all you have to do is wait, if you placed the order before 12noon we will try to have it dispatched that same day, please allow up to five working days for delivery. All orders received after 12.00pm GMT will be treated as received next working day. You can now e-mail us with your design, image and/or border ideas, if we can do it, your idea will be online within 24 hours ready for you to place your order. *Next Day service is subject to stock availability. Our standard delivery is recorded and requires a signature upon receipt. Guaranteed Next Day Delivery is also available. We are not responsible for delivery times. Delivery times are provided by the carrier (RoyalMail), excluding weekends and bank holidays, and may vary with package origin and destination, particularly during peak periods. WE WANT YOUR FEEDBACK:We want your opinion! To improve our Customer Service we need feedback but as a mail-order company, we rarely hear back from our customers. This is your chance to tell us what we are doing right, what we are doing wrong and where we can improve our service, website or sales procedures. If we are doing well and you had a good experience dealing with us, then let us know.